The dominating mountains in the Chilean Lauca National Park are the two Payachatas (twins) Volcan Parinacota and Volcan Pomerape. The first one is with 6342 meters sea-level slightly higher and it is a perfect cone, one of the most beautiful mountains on earth. Both are covered with snow and ice. They are located on the border to Bolivia, there in the Sajama National Park . 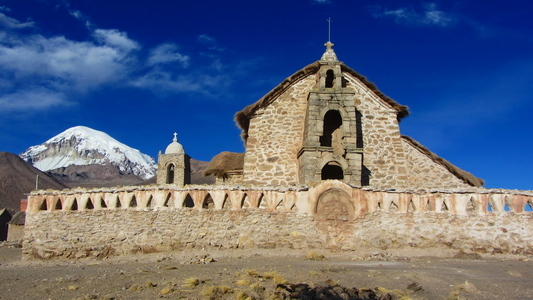 On foot of the Payachatas are the picturesque villages Parinacota (Chile - West side) and Sajama (Bolivia - East side). The most popular and common ascent to Volcan Parinacota is from Sajama via the northern ridge, which arises from the saddle between the two volcanoes. It provides beautiful views to the southern glacial face of Volcan Pomerape and to Bolivia's highest mountain on the opposite side of the village: Majestic but icy Nevado Sajama (6542 meters sea-level). Due to the high altitude of the village Sajama (more than 4200 meters) good acclimatization is mandatory. On the Chilean side are some nice tours to gain it properly. Despite the extreme dry climate both national parks have abundant fauna, wildlife as well as domestic animals. We did first 5092 meters high Cerro Guane Guane (GPS coordinates of the summit: S18 09.234 W69 16.320). It is a five hours tours, mainly over the western ridge with a good path. We begun this tour about six kilometers North of the village Parinacota on a falling slope, because we still had some trouble to get our car started (GPS coordinates: S18 09.781 W69 17.674). On the next day we climbed up Cerro Choquelimpie, 5353 meters sea-level (GPS coordinates: 18 15.129 W69 13.511). It was a much longer trip than Cerro Guane Guane, because we started at the ranger's station at Lake Chungara to have a secure parking lot of our car (GPS coordinates: S18 15.073 W69 10.604). We had to cross three or four valley till we reached the northern ridge to the summit. Like on Cerro Guane Guane the views to the Payachatas and the lakes in the Lauca National Park were outstanding. Crossing the border to Bolivia was painful for most of the people, because it was Sunday. Endless truck rows were on both sides of the frontier. We were lucky because we could bypass them. On the first day we took our bicycles and went first to Laguna Huanakota and second to the hot springs. The 35km drive was rather exhausting because it was a dirt road with much sand. But the hot springs were superb. Eliseo drove us with his 4x4 car to the starting point to Volcan Parinacota (GPS coordinates: S18 09.523 W69 06.082). Thanks to Eliseo we found an ideal and comfortable campsite in front of a huge rock, which protected us from the strong wind (GPS coordinates: S18 09.149 W69 07.341). We wake up at 4:00AM to start the adventure. When we were ready to go two Spanish Ladies with their guide came down from the mountain. They had given up because it had been extremely cold and there were many penitents. Maybe they had started their ascent too early? 2012 was a year with unusual lot of snow. Consequently the snowline was very deep, also on the sunny northern side. It meant that we had penitents half the way to the summit, more than 600 vertical meters. Some were small (few centimeters), but some were quite large up to a height of one meter. Some were snowy, but some were icy - hard like steel. It was an endless fight, but somehow we managed it. Volcan Parinacota has a spectacular crater with a diameter of approximately 2 km. The 6342 meters high main summit (GPS coordinates: S18 09.703 W69 08.701) is on the northern side; so we had to walk a little bit on the crater rib. Thanks to the penitents the descent was long, about the same time like the ascent. It was already more than 1 hour dark, when we returned to our tent. And we had many blue and some bleeding bruises on our legs, also thanks to the penitents. We were so tiered that we took no dinner despite the fact that we had eaten just few cookies on the mountain. Immediately we slept and we awoke not before 9:00AM in the next morning. Our breakfast was rich and delicious. Our trails of Volcan Parinacota, Cerro Guane Guane and Cerro Choquelimpie are included in the GPS coordinates files of Bolivia and Chile. We considered also to climb up Nevado Sajama but Eliseo told us that it is very dangerous this year because of very steep and icy stages. Besides that we were a little bit tired and the weather forecast was everything but adequate for climbing high mountains.